Is your church a shadow of its former self, once vibrant with life but now all but dead? Your Sunday morning attendance is a fraction of what it once was, finances are getting desperate, and your sense of mission seems nonexistent. That's where Don Ross was. Most onlookers saw no future in his church. But Jesus saw a place for them, and He molded Don into a Turnaround Pastor, a leader to revive God's people to do His work. Turnaround Pastor is both a riveting story and a practical guide complete with actionable steps to save, revive, and build your community of faith. Learn from Dr. Ross' personal experience and coaching expertise how to communicate effectively with your congregation, make courageous decisions to move your church forward, lead through major changes, cast meaningful vision, advance Christ's kingdom in your community, and become a Turnaround Pastor. 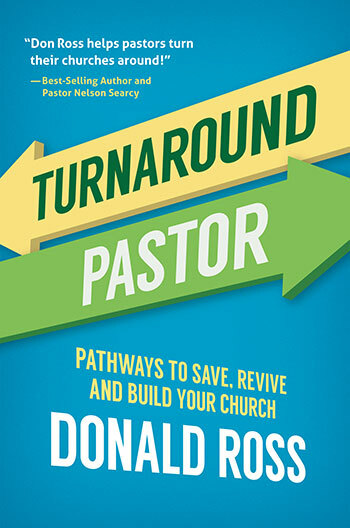 Dr. Donald Ross is the founder of the Turnaround Church Coaching Network, which helps pastors of plateaued or declining churches move forward. He is part of the Northwest Ministry Network and has a Doctor of Ministry degree from Bakke Graduate School in Seattle. His dissertation, Re-Engineering the Large Declining Church, focused on leading turnaround churches, drawing on his own experience turning around Creekside Church in Seattle, Washington. Don has 30 years of experience as a pastor, church consultant, and leadership coach, and has worked with churches ranging in size from 35 to 5,000 members. Don and his wife, Brenda, live in Kenmore, Washington, and have three married children and seven grandchildren.